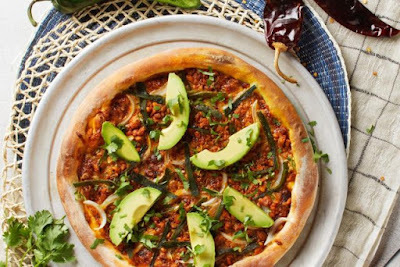 The changing of the seasons sees the arrival of California Pizza Kitchen's 2018 seasonal fall menu featuring the Spicy Chorizo Pizza. The Spicy Chorizo comes topped with Mexican chorizo, housemade guajillo pepper sauce, roasted poblanos, onions, quesadilla cheees, fresh avocado, and cilantro. - Pumpkin Cheesecake - Pumpkin cheesecake over a layer of classic New York cheesecake, on a buttery graham cracker crust. - Roasted Garlic Chicken with Seasonal Vegetables - Pan-roasted chicken breast in lemon-garlic sauce with roasted fingerling potatoes, cauliflower, Mediterranean herbs, and seasonal vegetables. - Sugar Plum Sangria - A blend of red wine, Captain Morgan Spiced Rum, St. Germain Elderflower, cranberry, and lemonade with hints of stone fruit topped with a little champagne. - Chorizo + Black Bean Piadina - A "pizza-style" sandwich filled with chorizo, black beans, quesadilla cheese, charred red onion, salsa verde, lettuce, and fresh cilantro. - Grilled Steak Salad - Warm steak (cooked to medium) served over chopped lettuce and arugula, Nueske’s applewood-smoked bacon, jicama, red cabbage, charred red onion petals, tomatoes, and Gorgonzola, tossed in blue cheese dressing. - Bolognese Spaghetti - Rustic meat sauce with Cremini mushrooms, sprinkled with scallions. - Sweet Pea Carbonara Pea-filled pasta purses, Nueske’s applewood-smoked bacon, and spinach with Parmesan cream and cracked black pepper. - Tomato Basil Spaghetti - Italian tomato sauce with sauteed garlic and fresh basil. 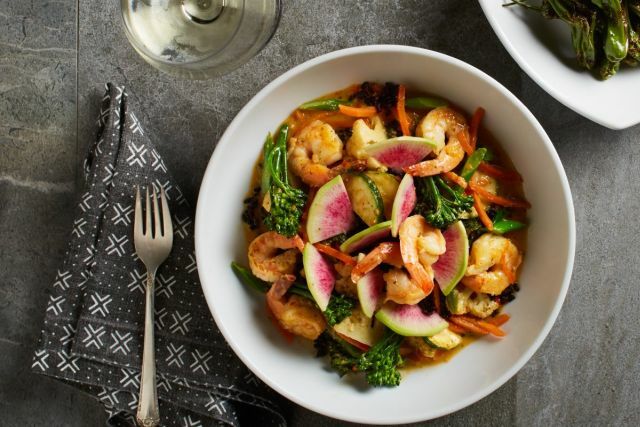 - Shanghai Power Bowl - Seared shrimp, black heirloom rice, baby broccoli, cauliflower, zucchini, carrots, and watermelon radish, served warm in a house-made Shanghai sauce. - Sonoma Grilled Chicken Flatbread - Topped with marinated and roasted red grapes, grilled chicken, double cream Brie, caramelized onions, Parmesan, and fresh wild arugula. - Cabana Splash - Milagro Silver tequila, RumHaven coconut rum, agave sour, pineapple juice, sparkling water, fresh mint, and poblano peppers. - Tropical Mule - Grey Goose vodka, RumHaven coconut rum, ginger beer, Monin Passion Fruit, and agave sour. - Woodford Old Fashioned - Woodford Reserve bourbon, Cointreau elixir infused with espresso beans, bitters, and a spiced tart cherry. Photo via California Pizza Kitchen.